Whether you are looking to recruit EECS students, are interested in raising your organization’s visibility, or just looking for ways to connect, getting involved is easy. Review the options below and let us know which of these programs are a fit for your organization. Most events require pre-registration. Download these slides (in PDF format) to save for reference or share with others about the many ways your organization can connect with EECS students. Job and internship postings are free and easy to do. Postings for both undergrads and alums are available via Career Services: http://career.oregonstate.edu or call 541.737.4085. The School of EECS also sends out a weekly electronic newsletter to all undergraduate and graduate students. To post to this group, email tina.batten@oregonstate.edu. We strongly encourage you to post via both venues. This service is free. 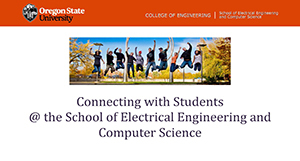 The CS Capstone and ECE Senior Projects program offers sponsors and mentors a great way to form a connection with seniors soon to be in the work force. Capstone Senior Projects last for the entire academic year. Suggested donation $5K. INSPiRE offers a convenient package approach to university relations, helping companies connect with EECS students, build and maintain connections with the School of EECS, access resume books, even participate on our Industrial Advisory Board. Suggested donation $10K. This event takes place the evening prior to the October Career Expo. Be prepared to introduce the students to your company and spend time connecting! Suggested donation $1K/space. Come network with students and faculty during Career Expo week! EECS Networking Night includes students from the School of Electrical Engineering and Computer Science ranging from Freshmen - PhD. Suggested donation $1K/space. Each December and June, students from our online Computer Science program gather in the Portland, OR metro area with members of industry for a one-day Student Seminar and Career Showcase. Students in this program have already completed a bachelor's degree and are working on a second bachelor's in Computer Science. As part of the event, attendees go through mock interviews and network with industry guests. 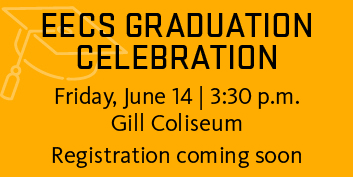 For more information or to register for our next event, contact Tina.Batten@oregonstate.edu. Looking for a different way to engage with students? HWeekends (hardware hackathons) target students from all engineering majors and business, providing a venue for them to build something new in a 30-hour time span. Industry sponsors have the opportunity to mentor young engineers, judge projects, while building brand visibility on campus. Contact tina.batten@oregonstate.edu for details. Suggested donation $5K. Industry needs fresh perspectives and ideas to keep inventing the future. Where better to find these fresh ideas than by tapping into students’ creativite minds? Student interns are hired in small teams to work on a specific project with a client. These students leverage their own excitement, faculty mentoring, and industry guidance to create things that have never been seen before. Suggested donations vary depending on project. Contact Don Heer (Donald.Heer2@oregonstate.edu) for more information. For over 30 years, MECOP (Multiple Engineering Cooperative Program) has been bringing member companies and student interns together. Member companies also participate on the MECOP's Advisory Board, enjoy other opportunities to connect with students, etc. Contact their offices at (888) 960-9279 or visit https://www.mecopinc.org/ for more information.